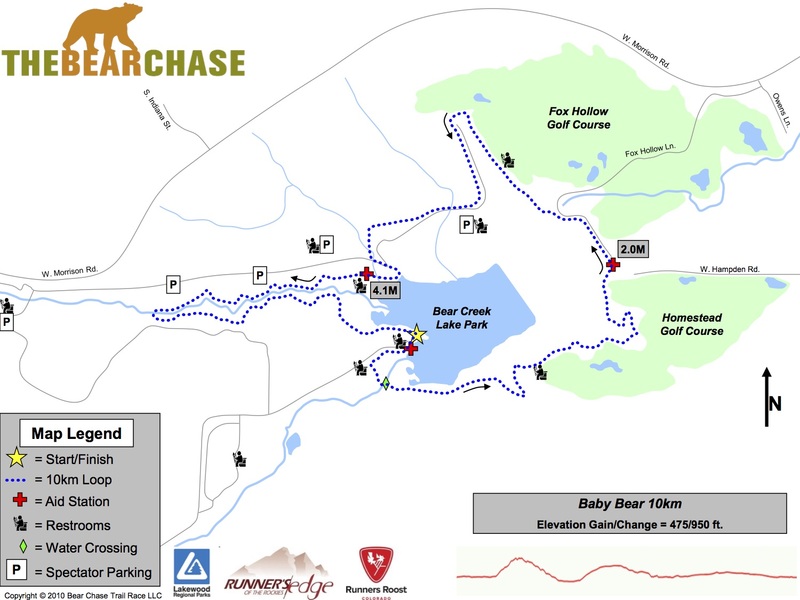 The Bear Chase Trail Race – 100k, 50 mile, 50k, Half Marathon and the Baby Bear 10k Trail Race at beautiful Bear Creek Lake Park, in Lakewood, CO.
100k, 50 mile, 50k, half marathon, and 10k. 95% of the course is on soft surface and single track dirt trail. Packet pickup will take place at Runners Roost – Lakewood from 11 AM – 7 PM on Friday, and 10 AM – 6 PM on Saturday. 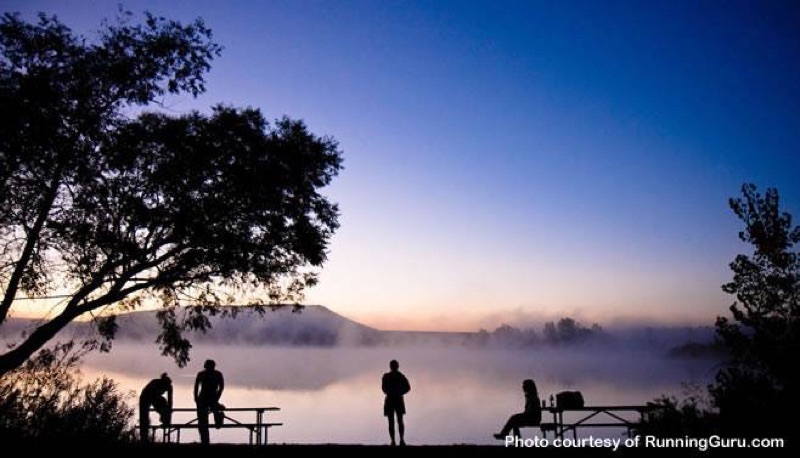 Runners can also pick up their race packets at the Start / Finish in Bear Creek Lake Park, the morning of the race starting at 5:30 AM. Baby Bear 10k = 475/900 ft.
Half Marathon = 900/1,800 ft.
50 mile = 3,400/6,800 ft. 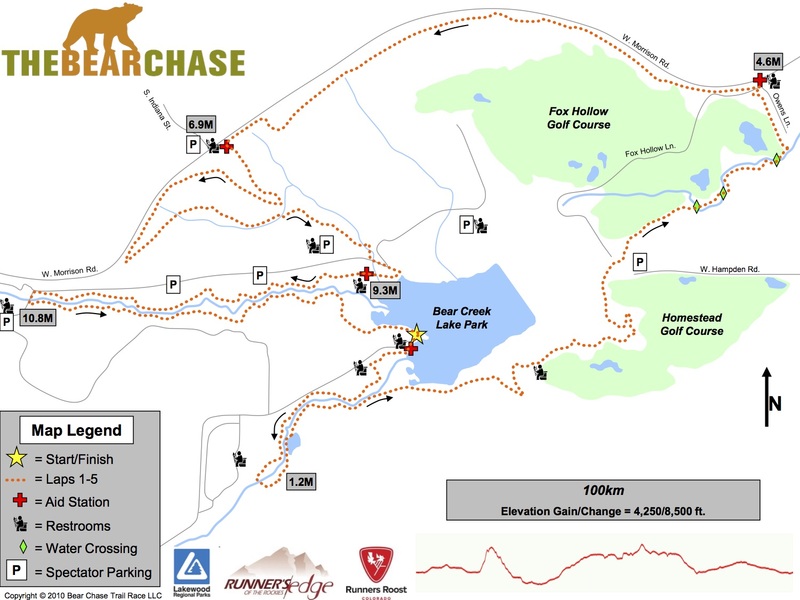 Parking will be inside Bear Creek Lake Park at designated lots, near the Start/Finish area. Please view the race guide for further details and map. In an effort to minimize trash on the trails, The Bear Chase is a CUP-FREE RACE. We will not provide paper cups for water and electrolyte drink, and all runners will be responsible for carrying their own refillable hand-held bottle or hydration system. With an average distance of only 2.5 miles between each aid station, you’ll appreciate not needing to “overload” your bottles with fluids. Paper cups will be provided for soda, however you will be required to throw your cup away before leaving the aid station. 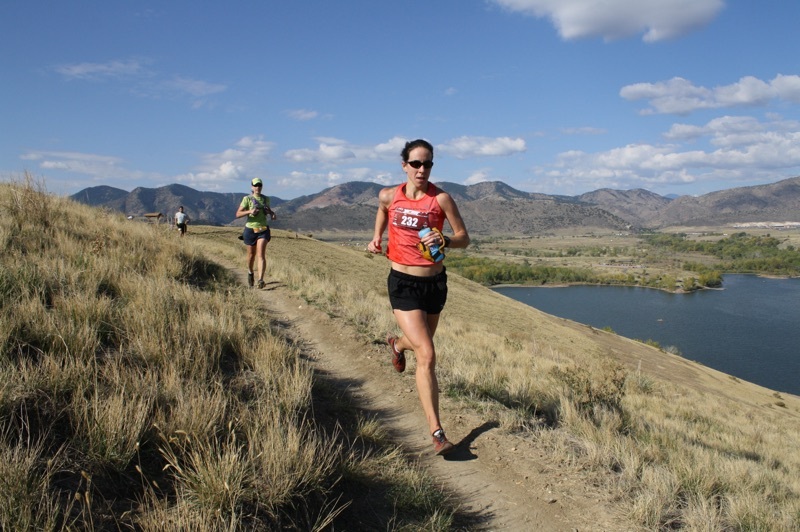 Also, following the trail runner mantra of “leave no trace”, any runner found intentionally littering on the trail will be disqualified from the race. HydraPouch: One option for runners to run “light”, without a bottle, is the HydraPouch, a soft rubber, hand-held pouch with a clip that will allow you to fill and drink your fluids quickly at each aid station. (Some runners in the Half Marathon & 10K may like this option, however hand-held bottles are recommended for the ultras.) HydraPouches are now available at Runners Roost – Lakewood, and may also be purchased at www.hydrapouch.com. There will be a hard cutoff for all ultrarunners at 6:00pm. Any runner who has not started their final lap by 6:00pm will not be allowed to continue. 100K runners missing the hard cutoff will be given credit for a 50M finish, but will be excluded from age group awards. 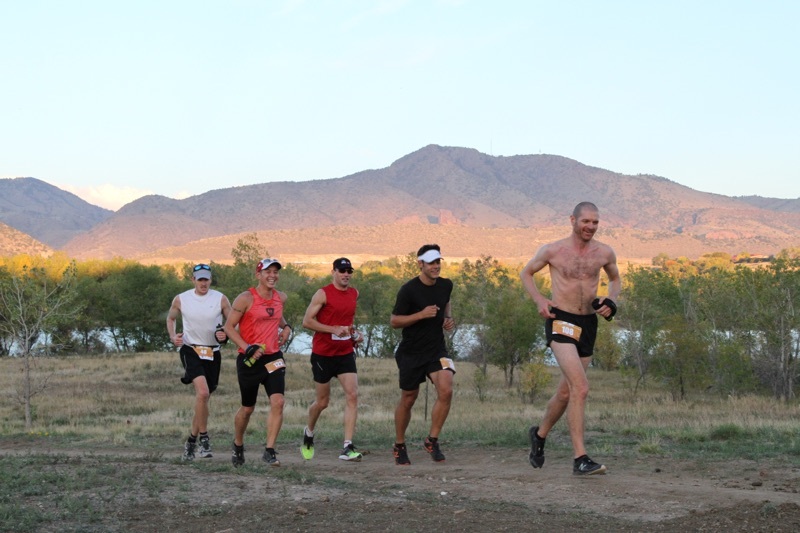 After 6:00pm, we will have rolling cutoffs at each aid station following a 16:45 average pace. The course limit is 15 hours. 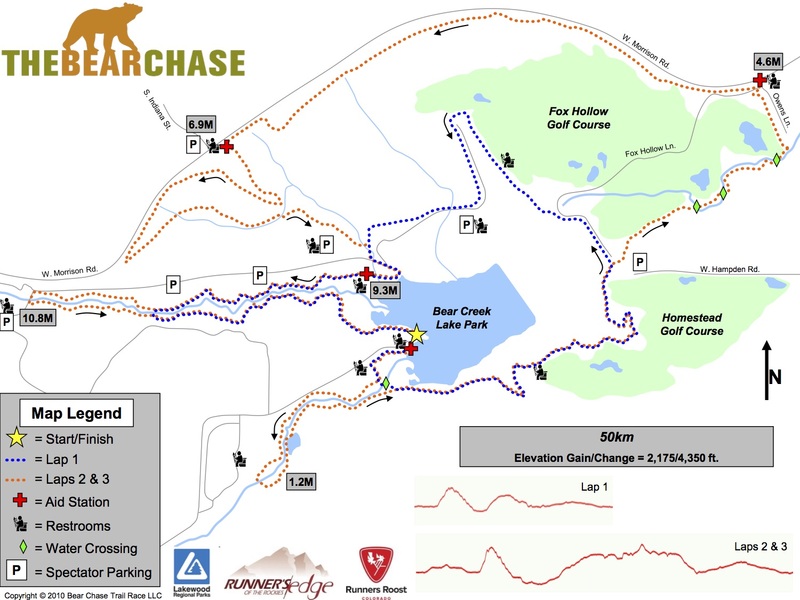 Friends and family can follow your progress along the Bear Chase course in real time! 100K and 50M runners will be allowed the assistance of pacing after 3:00pm. Runners may only have one pacer at a time and muling (i.e., carrying food/fluids/clothing) is not allowed. All pacers will be required to check in at the Start/Finish prior to pacing, and may ONLY begin pacing from the Start/Finish. Runners may receive crew assistance at the Start/Finish area ONLY. Crewing assistance at other locations on the course will not be allowed. Runners may leave a drop-bag at the Start/Finish, and also may receive crew assistance at the Start/Finish area. Any runner receiving crew support outside of the Start/Finish area will be disqualified. 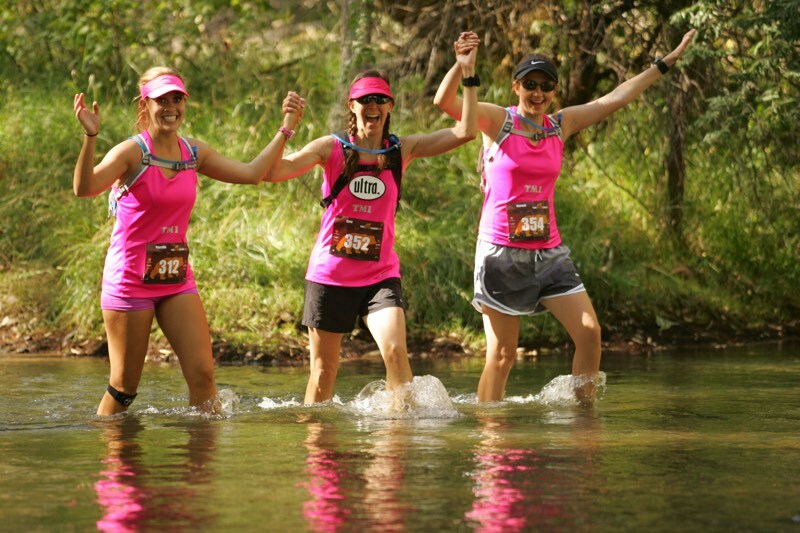 The Courtyard Denver Southwest/Lakewood has a special hotel rate for the Bear Chase! 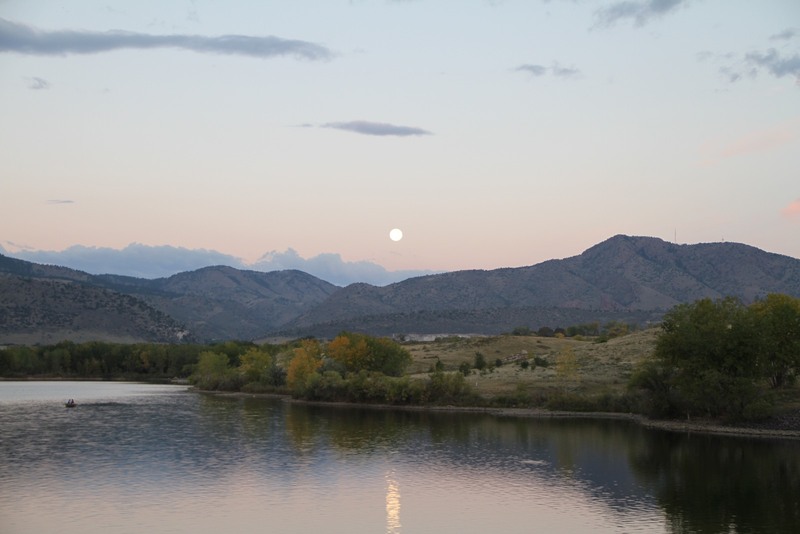 Book online or call 303-985-9696 and provide the group code “BCR”. From 10K to 100K for all ages and abilities! 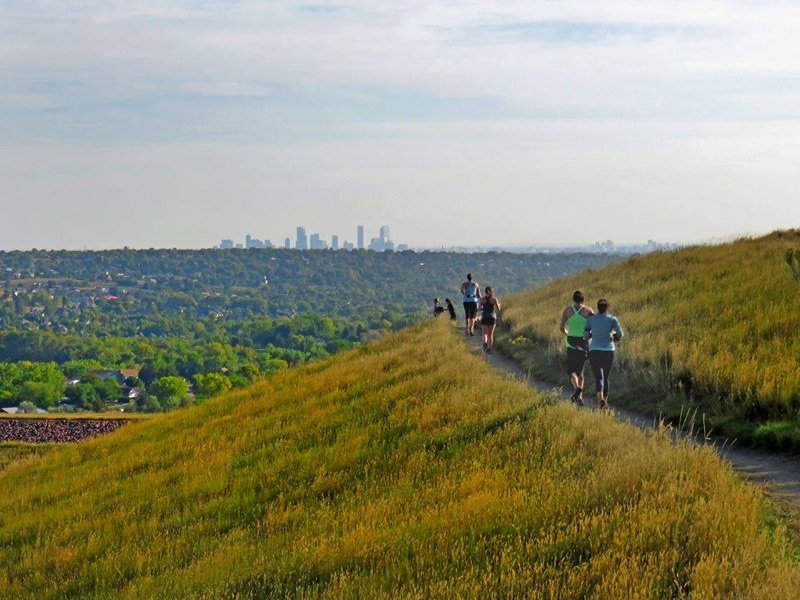 A portion of every registration will be donated to the City of Lakewood and Bear Creek Lake Park to help fund open space preservation projects. 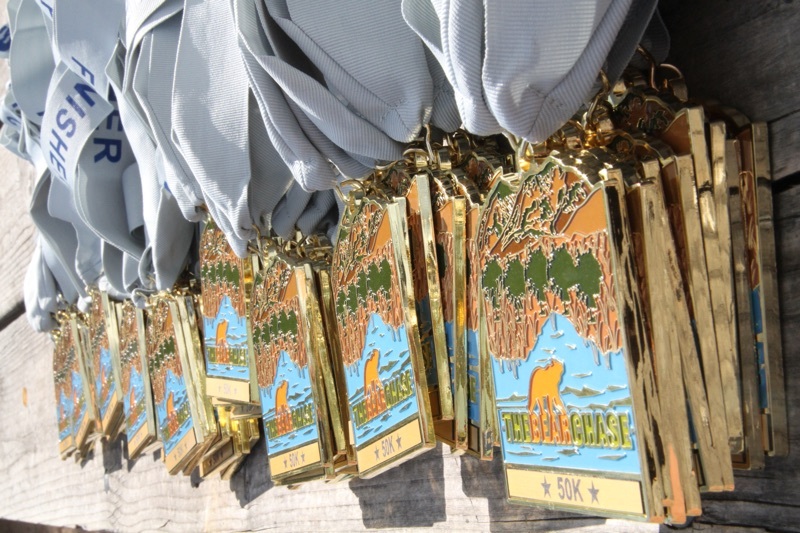 Of course you get some great race swag with your registration, but maybe you need more. Visit our online store for more cool gear; outfit your cheering section! 2013 results are not eligible for course records since an alternate course was used for all races due to the massive flooding at the lake.